MANCHESTER, England (AP) — In a 12-minute rant using statistics from a notebook in front of him, Jose Mourinho launched a strong defense of his time in charge of Manchester United that included a dig at managerial rival Pep Guardiola at Manchester City. 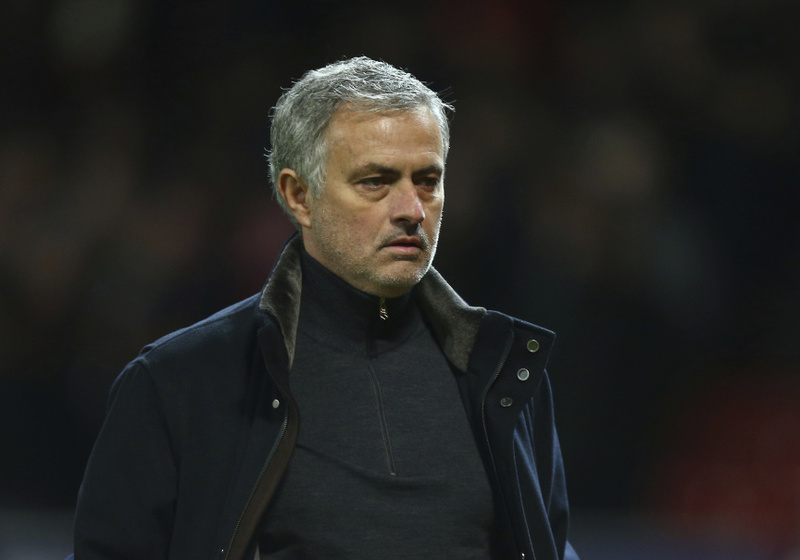 Mourinho came under criticism this week after United's feeble exit from the Champions League at the hands of Spanish club Sevilla on Tuesday. Three days later, Mourinho used a news conference to highlight what he perceived as United's lack of "football heritage" in recent years because of its poor results in the Premier League and in the Champions League. He spoke of the groundwork he was laying at United in his second year at the club, while also claiming that much of City's success this season could be put down to its investment in players before Guardiola became manager in 2016. Mourinho then insisted he was "on the same page" as United's owners and its board, and said he was not going to "run away" or change his mentality in the wake of the Sevilla loss. It brought back memories of Rafa Benitez's infamous rant about "facts" in 2009 when in charge of Liverpool. The Spaniard listed incidents involving then-United manager Alex Ferguson and referees from throughout that season. Like Benitez, Mourinho used prepared stats he had brought with him, initially reading out United's results in the Champions League since reaching the final in 2011. "So, in seven years with four different managers, once not qualified for Europe, twice out in the group phase, and the best was a quarterfinal. This is football heritage," Mourinho said. Then he listed United's finishing positions in the last four seasons of the Premier League — seventh, fourth, fifth and sixth. "So, in the last four years the best was fourth. This is football heritage," Mourinho said. "It means that when you start the process, you are here, you are there, or you are there. It is heritage. It's heritage." A reporter attempted to interject but Mourinho continued, turning his focus to Man City's recent record in which the team won the Premier League twice over the last six years, and surely will do so again this season as it holds a 16-point lead with eight games left. But in an attempt to downplay Guardiola's role this season, when City has also won the League Cup and might still win the Champions League, Mourinho said: "Do you know what is also heritage? It's that (Nicolas) Otamendi, Kevin De Bruyne, Fernandinho, (David) Silva, (Raheem) Sterling, (Sergio) Aguero — they are investments from the past, not from the last two years. From the past." Mourinho said he was clear which direction United was heading, and so were the owning Glazer family and executive vice-chairman Ed Woodward. "We are exactly on the same page," he said. "We agree in everything. We know that we have a process. We agree in the investments, we agree that we have what we have, the investments we are going to do are going to be progressively season after season. We need more than the investments, we need also the time. We are exactly in the same page. Then, in a message to his critics, Mourinho added: "There is quote that I like, which is something like, 'In every wall is a door.' ... I am not going to run away, I am not going to disappear, I am not going to cry because I heard a few boos. I am not going to disappear from the tunnel, running immediately. The next match I'll be the first to go out. I respect the fans, I am not afraid anything. I am not afraid of my responsibilities." "You know, I understand that for many, many, many, many, many, many years, it was really, really hard for the people that doesn't like me," Mourinho said. "'Here he is again.' 'Here he wins again.' 'Here he is again.' 'Here he wins again.' So for 10 months, I win nothing ... I beat Liverpool, I beat Chelsea, I lose against Sevilla and now is there a moment to be happy." United hosts Brighton in the FA Cup quarterfinals on Saturday.